available to purchase online now. We anticipate tickets to sell out quickly, so do book now to avoid missing out !!! Wonder why he never does Scotland or Wales? Because your whole Country is no bigger than a medium size ranch in Texas and it should be easy to go him a few minutes down this road or that? You guys even have trains ! Nah. I would rather do the other Brit thing and moan about it. It's 200 miles from Glasgow to Ripon and the ol' bugger always chooses places that require a change of trains for me. 200 miles Bernie!! By the way,how much is a gallon of petrol in US now? Interdenominational services are common here between the various faiths and I'm sure there's a fair few Tull fans among the clergy of the Church of Scotland. There's some beautiful Anglican cathedrals in Wales too - Llanduff in Cardiff - I know a duck that would be in the front pew! We're tripping over Ian Anderson Christmas venues in this small island. Gas is about $4.00 a gallon,,,it would take high algebra to figure that out in Pounds/liter. 200 miles? I'll come take you that far on the back of my bicycle, easy. ( no hills, right?). 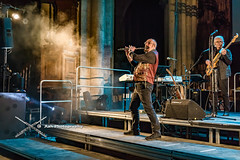 Ian Anderson (flute, vocals, and magic), John O’Hara (piano and organ), David Goodier (bass guitar), Florian Opahle (guitar), Scott Hammond (drums), Choristers of Wells Cathedral, and some surprise guests. Whether your Christmas is a secular affair of gift-giving and family togetherness, or an observation of one of the most important days in the Christian calendar, join us for some uplifting Christmas spirit, music, readings and maybe even a prayer or two. 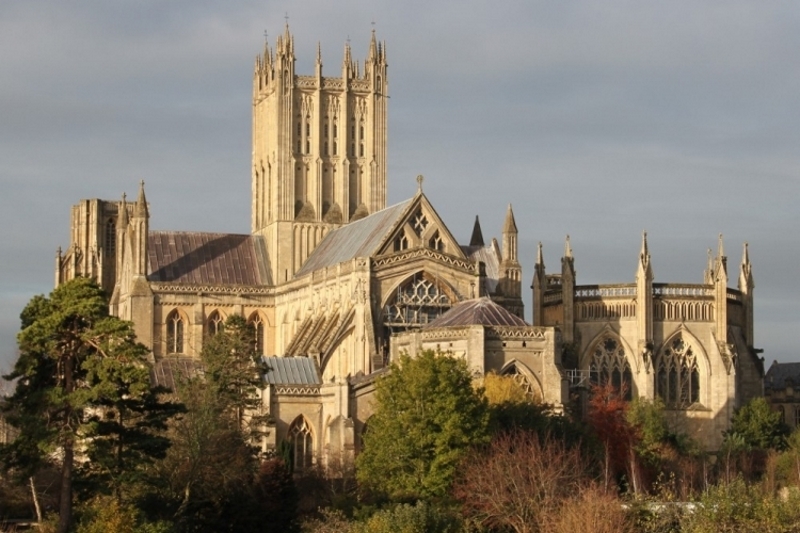 The programme will include some of the best-known repertoire of Jethro Tull and a few snippets of seasonal traditional church and classical music performed by the Choristers of Wells Cathedral Choir. Hope you get FRONT ROW Ash !!! Looks like a brilliant venue - wonder if "the powers that be" have ever thought of a live album ? 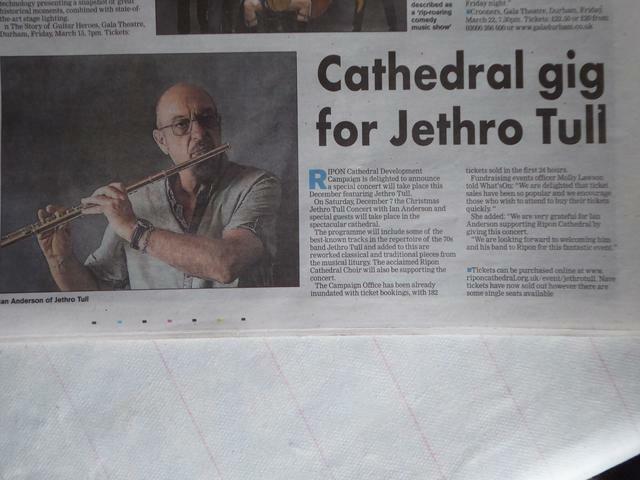 This article is in today's Northern Echo and it mentioned that 182 tickets were sold for the Ripon Cathedral Concert in the first 24 hours of going on sale plus the Nave is now sold out. 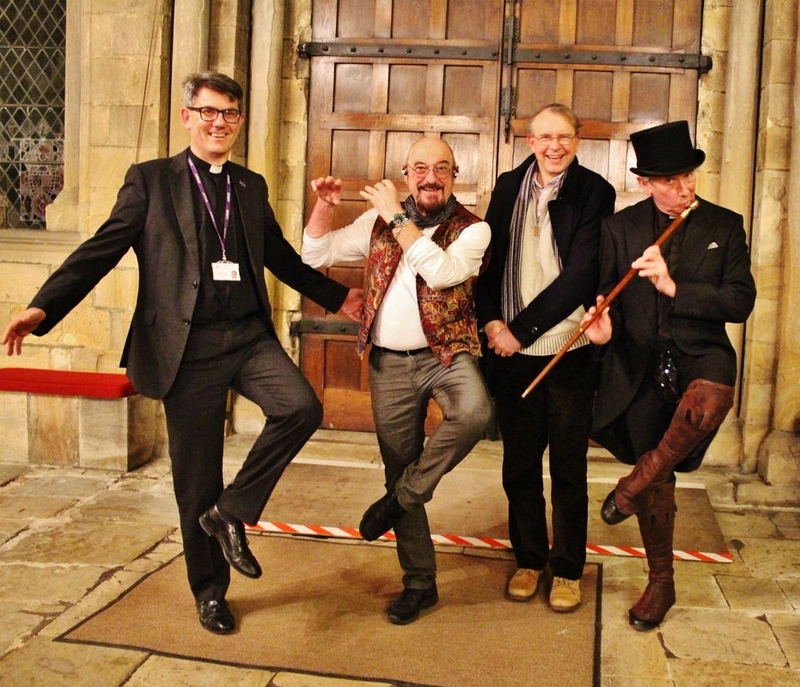 Jethro Tull will be mixing rock with Christian traditions this Christmas when they perform in Ripon and Wakefield Cathedrals to help them raise money for the upkeep of their buildings. 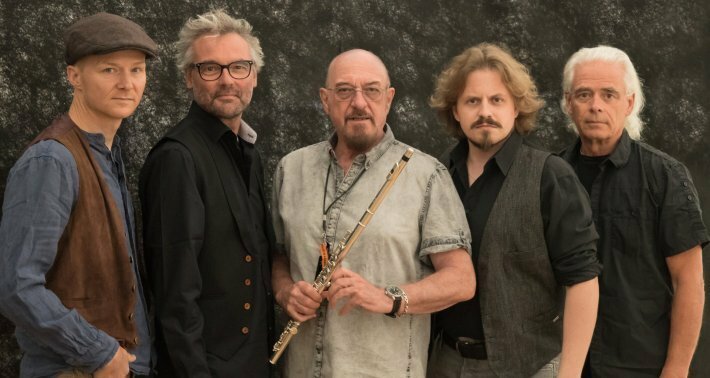 Although the legendary rock band's frontman and flautist Ian Anderson is a self professed Deist and Pantheist, the Christian faith and its traditions hold a special place in his heart, not to mention the beautiful buildings where many continue to worship. "If I can help draw people in to these beautiful and historic buildings to savour just a little of the spirit of Christmas, then it is a worthwhile effort," he said. He and the band will be generously giving over 100 per cent of the proceeds from both concerts to the cathedrals to help them raise some much needed funds. 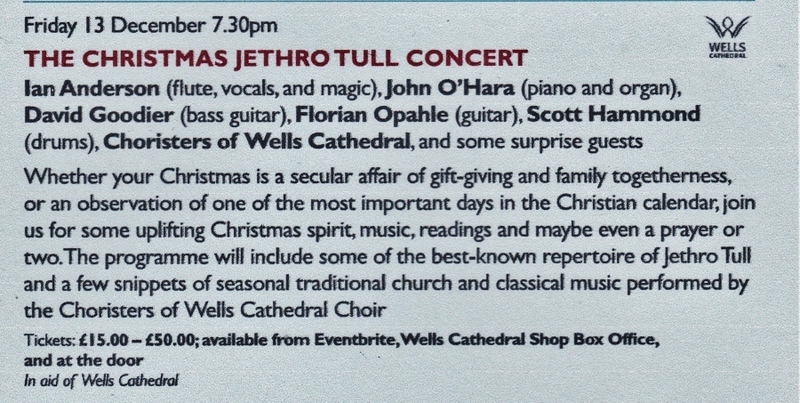 Anderson is promising an evening of Jethro Tull classics blended in with seasonal traditional church and classical music. "I try to balance the festive time of year in song with a few of the elements of an old fashioned carol service – all delivered with good humour and good cheer," he said. 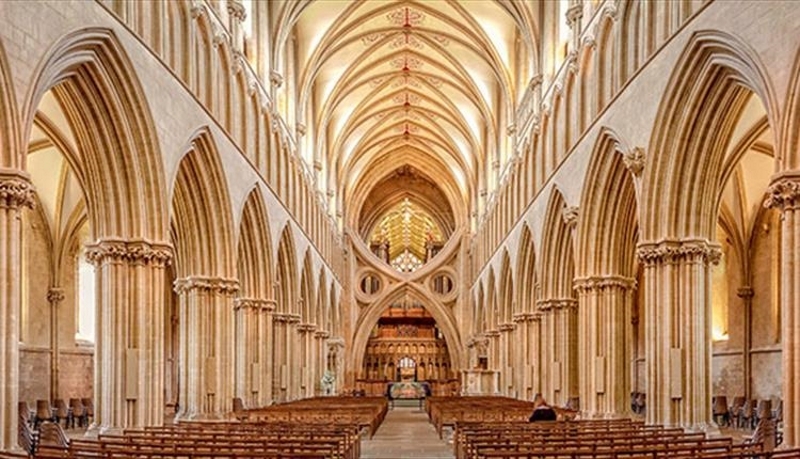 After playing Wakefield Cathedral on December 6, the band will head north to Ripon Cathedral for a gig the following evening that will be supported by its cathedral choir. "Whether your Christmas is a secular affair of gift-giving and family gatherings, or a more worshipful recognition of one of the two biggest days in the Christian calendar, join us for some uplifting Christmas spirit, music, readings and maybe even a prayer or two," said Anderson. He added: "The bringing together of people of all backgrounds, cultures and faiths in this way is possible perhaps only under the auspices of modern Christianity, especially in the Anglican Church." Ripon Cathedral said its campaign office has been inundated with ticket bookings. Fundraising events officer Molly Lawson said: "We are delighted that ticket sales have been so popular and we encourage those who wish to attend to buy their tickets quickly. 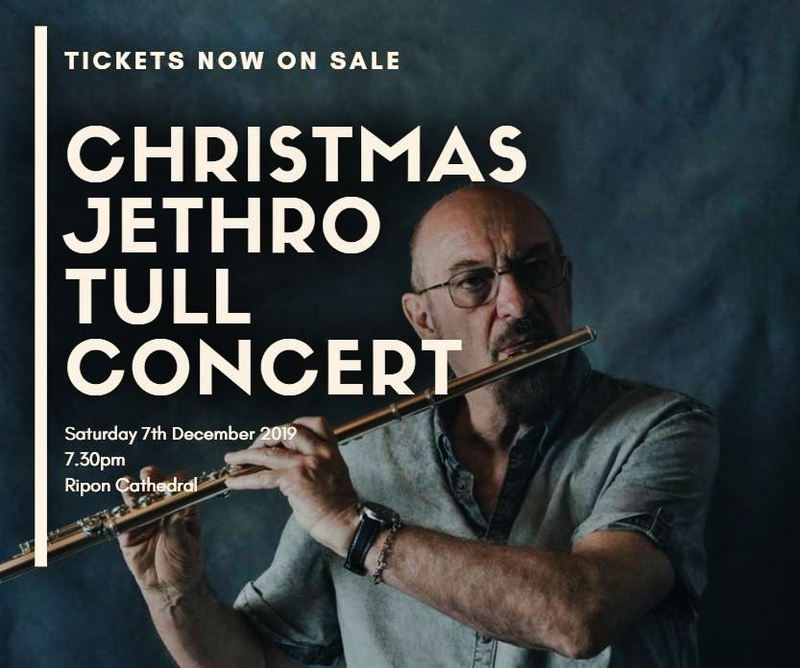 "We are very grateful for Ian Anderson supporting Ripon Cathedral by giving this concert and we are looking forward to welcoming him and his band to Ripon for this fantastic event." The newest A New Day is a typical issue...some good information and interviews that only they can get and share, some news that we forum types already have thanks to the advantage of electrons over print and a healthy dollop of their fixed belief that they are sole owners of most Tull history. Why does it matter who put what from what book and article and post and note written in geography class into another Tull related publication? It is all about our favorite band and all of us learning more and spreading the word and loving the music...and speaking of love: the absolute highlights of the current issue are the two amazing pictures of Anna Phoebe gazing upon Ian with sincere admiration, appreciation and love. I really respect that woman for her clear and uninhibited understanding and depth of feeling for Mr. A. 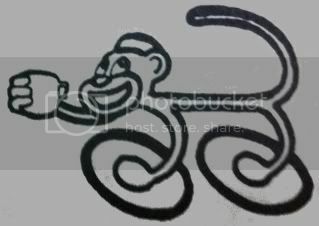 Check out the photos...you will see what I mean. Well said Bernie. It's an unfortunate fact that this very same attitude destroyed one the original QUEEN fan clubs many years ago when the organisers thought that they were the sole owners of information and goodies and as such left the vast majority of the members "out in the cold". It's also true that attitudes change over the years, something that many have noticed over the years. Exactly. It's more to do with ego rather than the music. Sorry, I have to disagree, at least when it comes to the review of the Parker book in the last AND. I thought it was very reasonable to point out where whole passages had been lifted. It's simply a matter of intellectual honesty to acknowledge your sources. That's a way of recognising all the work that has gone into the excellent notes in the recent box sets. As I've said elsewhere on this forum, it's a real problem with the Parker book that you wouldn't know that many other books had gone before. I didn't recognise the wholesale lifting of passages but that just makes it worse in my book. And I still stick to my view that the best general overview is the David Rees book, even if it's way out of date now. So I thought it was a great review and, in the circumstances, very fair-minded. I really look forward to my copy of AND, just as I look forward to what I read on this Forum. And I say that with no connection to AND or the people behind it. The review of the Parker book in AND was fairly reasonable and the author imo missed a vital point concerning the title. To make his point much better he should have devoted a final chapter to the later years after his cut-off point of 1979. He could have then had space to outline his reasons about these being less than the glory years. However the point being made in the original post, as I read it, is the perceived elitism in some quarters of the Tull fan world which does no one any good. It gives the impression that some are either more informed than others or more privy to the thoughts of Mr A and Co when, in fact, they are patently not. I agree with you about the ‘missing chapter’ in the Parker book – and even his rather thin conclusion would have been improved without the snide remarks about band members post-1980. I’m not arguing about the perceived elitism either. There were a number of points made in the original post, but the one that bothered me was ‘Why does it matter who put what from what book and article and post and note written in geography class into another Tull related publication?’ It matters because it’s a matter of intellectual honesty. It’s fine to quote from somebody else’s work, if you are clear about what you are doing. Otherwise it’s theft of somebody else’s work. Given this, I think the review is remarkably fair and even-handed. This is not a matter of lifting material for the web, which we know goes on. It’s a matter of a book produced for sale, sales from which I assume the author may hope to receive some royalties. In this case copyright, and the proper attribution of material, matters. I understand the importance and fairness of giving authors and researchers and interviewers credit for their work...but at a certain point, we reach a sort of critical mass of Tull history, known to all who have been paying attention and reworded and massaged and repackaged and quoted etc etc indefinitely. I do acknowledge and appreciate all the hard work and original production on the path of what we all see in Tull history. I have always given AND hefty credit for keeping Tull alive at a time when the pulse was low and the future was dim....that will always be a part of the Tull story.